The Sonoma County culture of excellence in food and wine influenced him to travel abroad after graduating from Cardinal Newman High School. He attended the University of London and enjoyed weekend trips to sample cuisines in many European cities. After graduating from the CIA in Hyde Park New York and working at Park Avenue Café under Chef Neil Murphy. Mullins enrolled at the University of San Francisco and earned a Bachelor of Science in Hospitality Management. “I met One Market, Executive Chef Mark Dommen as a USF student. Mark is very philanthropic and invited me to cook with him at many charity events. “ I worked for him at One Market and was influenced by his strong work ethic and humility. “ I have been fortunate to have several mentors in my years as a chef. Ben Davies, Executive Chef at Russian River Vineyards was instrumental in helping me develop flavors that tantalize the palate and Josh Silvers owner and Executive Chef at Jackson Bar and Oven is a premier teacher and helped me hone skills so vital to life in the kitchen…training cooks. 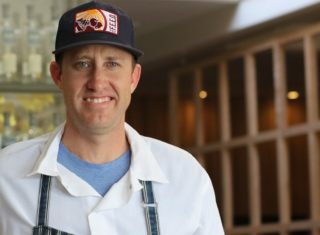 Chef Mullins has worked along side Traci Des Jardins, owner and Executive Chef of well known San Francisco eateries Jardiniere, Public House and Arguello among others. Bon Appetit Management Corporation at Google was a fascinating venture for Mike as he rode the infamous Google bus to work each day from is San Francisco apartment. At Cavallo Pt. in Sausalito, Mike an outdoor hiking and biking enthusiast, often rode his bike over the Golden Gate from San Francisco to the bucolic Sausalito restaurant.